The students are grouped by ages: 6 - 17. The tasks are divided into concept and type. Each concept has example tasks, to correct code, to copy code and to write code without help. I measure the number of tasks completed and the time elapsed in each one. I wanted to compare the performance of students by age and gender. 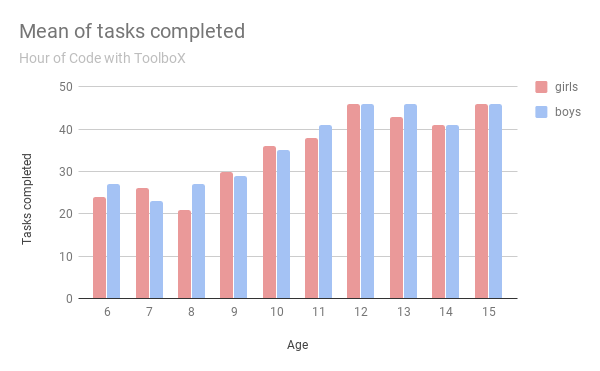 I draw a simple bar chart with the means of the tasks performed correctly. But the experiments have different durations and much dispersion. There is some more reliable statistical method than analyzing only the mean. I am not an expert in the subject and neither in statistics. If you want to report the dispersion, add some error bars, or better do a box plot, or even violin plot, but the latter require understanding of less introductory concepts (for tuning purposes). For a non-graphical presentation of e.g. age by task (and by gender as well), see contingency table. These can be nested. If you want to know if there are significant differences between the groups, read about the F-test. If want to test diffrences between individual tasks, you can do that too (e.g. t-test), but you have to worry about adjusting for multiple comparisons. I will not go into further details because this board is unsuitable for giving you a stats 101 education. And so is Wikipedia, by the way; its articles on such topics are generally too technical for the mere practitioner of statistics. It's best you talk to someone who has had at least that stat 101 level of education, although it would be better with someone who at least [still] practices statistics on some level. All else failing, read an intro textbook of applied statistics; or see coursera for a free class etc. You should also learn how to use a software package that does all of these, e.g. R or SPSS. Depending how good you are at programming you may find one or the other easier. With software like these, you can also easily do plot arrays that basically iterate over a covariate's (e.g. gender) level (i.e. values). There's no standard name for these, R calls them facets; SPSS calls them panel plots. Not the answer you're looking for? Browse other questions tagged data analysis validation or ask your own question. Does this recent twin study contradict Anders Erricson's view on the hereditary basis of talent?